In this lesson, we will learn how to convert customary units of length, such as feet, inches, yards, and miles, and compare them to solve real-world problems. How many feet are there in 98 yards? 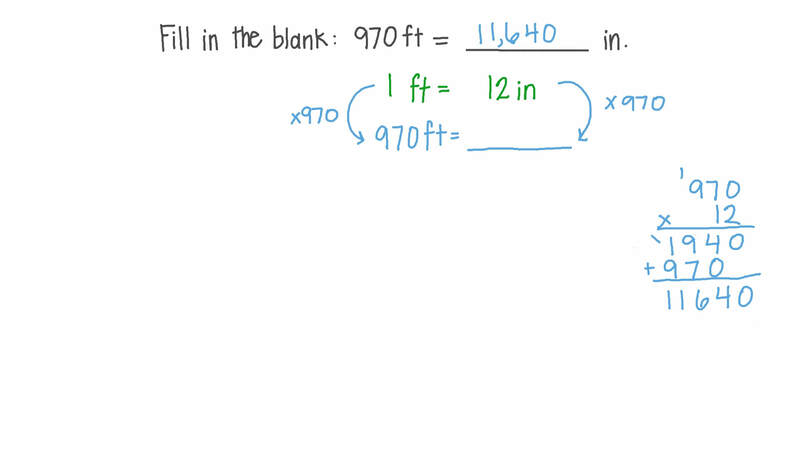 Fill in the blanks: 6 2 3 = i n f t i n .
Fill in the blanks: 970 ft = in. How many feet are there in 2 mi? The string on Adel’s kite is 44 yards long. How many feet long is the string? Samar needs 245 inches of fabric. If she bought 10 yards of fabric, would she have enough? Sarah is 14 feet from a gate, while Adel is 206 inches from it. Who is closer to the gate? Rania’s house is 3 miles away from school, while Nabil’s house is 3 262 yards away from school. Whose house is closest to the school? Complete the following: 1 8 2 4 0 = r d m i . If Nader threw his javelin 102 feet during practice. 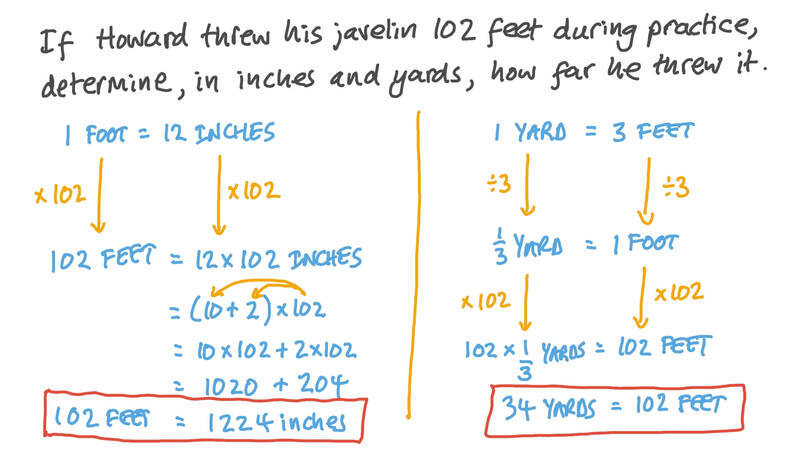 Determine, in inches and yards, how far he threw his javelin. How many feet are there in 26 yd? Complete the following: 1 2 4 7 = f t i n .
Complete the following: 9 0 = i n y d .
How many yards are there in 47 ft? Complete the following: 5 6 = m i y d .
Fill in the blanks: 6 6 5 = y d i n .
Fill in the blanks: 1 6 9 7 = i n y d i n .
Complete the following: 3 5 4 = f t i n i n .
The lengths of two wooden logs are shown in the table. Which log has the greater length? What is the maximum number of yards in 427 ft and how many feet are left over? Complete the following: 1 5 4 0 = y d r d .
1 = f t i n   . How many feet are there in 147 yd? 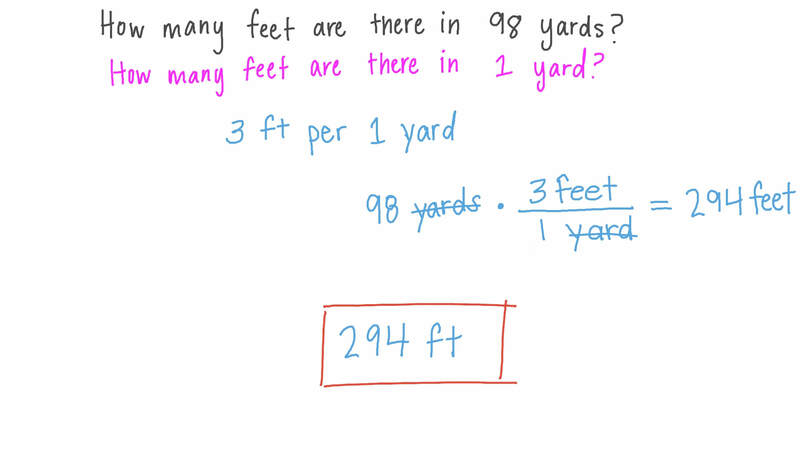 What fraction of a yard is twenty-eight inches? Express the answer in the simplest form. Complete the following: 6 4 = m i r d .